Since 1992, The McCreary Centre Society has surveyed youth aged 12 -19 in British Columbia every five years. In 2018, over 38 000 youth in 58 of BC’s 60 School Districts completed the survey. At least one classroom in each of SD 61’s middle and secondary schools participated in the survey. The survey was developed in consultation with young people, parents, and other experts in youth health and was administered by Public Health Nurses to students in mainstream public schools between February and June 2018. 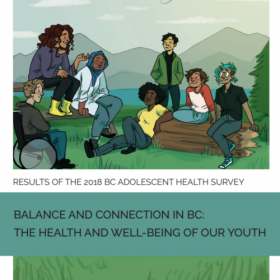 Survey results have been published in the document: Balance and Connection in BC: The Health and Well-Being of Our Youth. McCreary Centre Society offers Youth Action Grants (YAG) for youth who want to implement a project using the data from the survey, to improve youth health in their school or community. The Youth Action Council is also available to offer grant-writing workshops to young people who may be thinking of applying for a grant.